I'm thrilled to partner with California Giant Berry Farms for this post. As always, all opinions are my own. I had the pleasure of visiting California Giant Berry Farms in June and learn all about the family business and non-GMO strawberries that are never sprayed with pesticides! Their naturally large strawberries are the perfect addition to these kid-friendly bento box lunches! Ready or not, back to school time is officially here. And chances are, most of us really aren't ready. This time of year always ends up feeling daunting and chaotic. I'd say at least half the families I work with end up needing to reschedule their sessions because everything going on! But just like many other stressful seasons, the #1 key to success is planning ahead. And I'm thrilled to share some helpful tips and lunchbox ideas that kids won't throw away or come back home with a full lunchbox! Bento boxes are all the rage and rightfully so- they make for the cutest, while still practical containers for a child's lunch. Since we eat with our eyes first, it only makes sense that the more attractive and kid-friendly the lunch, the more likely they are to eat it! And with big juicy strawberries- what's not to like? California Giant strawberries are naturally large because of the perfect climate and soil they grow in, making them eye candy and tasting super sweet! As much as most kids love a PB & J, including unexpected and fun foods like pasta salads, pin wheels or even a fruit salad is a great way to liven up lunch. If your immediate thought is "My kid would never eat ________"- try including ONE new thing with other liked and familiar foods, like strawberries, blueberries or their other favorite fruit. Often times moms (and dads) go all out packing what they think is the coolest and healthiest lunch, but the kiddo is overwhelmed and even fearful of that many new foods. Try just one and consider including a favorite condiment or dipping sauce to entice them further! KISS Tip: Try cutting a wrap into pinwheels- little hands love the pinwheels it makes a wrap easier to eat. KISS Tip: Put a really thin layer of cream cheese on the inside of a wrap- it helps prevent sandwiches or wraps from getting soggy! The most popular KISS in the Kitchen recipe is actually this Viva Fiesta Turkey Wrap where I used some veggie cream cheese and also created pinwheels! ​Don't be afraid to "not pack a main meal". Many parents are concerned if they don't pack a sandwich or "entree", there isn't enough food! That couldn't be farther from the truth and often kids enjoy eating a lunch comprised of "heavier snacks" than a real meal. For more back to school hacks, including 10 recipes, head on over to California Giant Berry Farm's website to snag the free e-Book download and enter to win their Fresh Start sweepstakes where one grand-prize winner will get a $500 Visa gift card and 2 secondary winners will receive a $150 Visa gift card! Here are a few other healthy ideas that save you time, money or both! -Pre-prep breakfast by creating DIY Instant Oatmeal Packets (this saves money plus you can control how much sugar actually goes in there) or pre-portion and freeze individual smoothie baggies. You can find a multitude of recipes on Pinterest for both of these, but get creative and inspired by what your kiddos like! A great basic recipe is 1 cup strawberries and blueberries + 1/2 banana + 3/4 cup spinach placed in a freezer safe resealable bag and frozen until ready for use. Remove from freezer, place ingredients in a blender and add ~1 cup of your favorite milk. Blend in a high-powered blender until smooth. Add yogurt, tofu or your favorite protein powder for a protein boost! -Make batches of Snack Bites or bars like these Creamy Cashew Lemon Bites or these Gluten-Free Blueberry Oat Squares. -Bust out the crockpot and ask your friends to do the same. Instead of just picking out a new recipe, talk to the moms in your circle and have everyone pick a recipe. Not only does that help with meal planning accountability, but you can share the results and figure out what recipes are the easiest and tastiest! ​-Make sheet pan dinners! Almost as popular as Bento boxes, sheet plan meals are recipes that allow you to put everything on the same sheet and it cooks at the same time and temperature! Check out this Southwest Breakfast Sheet Pan Bake I just made last week! Love your tips Shannon! Can't believe back to school is already here. Those berries have such beautiful color, I don't think it would take much convincing to get my kids to eat them! Thank you, Laura! I know- the summer has flown by faster than ever. California Giant strawberries are definitely the prettiest and sweetest (IMO) because of the perfect combo of the location's environment. So deliciously juicy! The hardest part of my job as a Preschool Teacher is not teaching, but watching children eat unhealthy lunches and snacks. This sight is absolutely wonderful. Great ideas and helpful tips. What a blessing your job is to teach and shape young minds! So glad these lunch boxes are helpful. Bright berries definitely make for attractive lunches that entice little ones :). Thanks for stopping by, Linda! You're so welcome, Shelly! Thanks for stopping by and I hope your son enjoys the lunches also! Such awesome tips. The bento boxes are really fantastic for showing off colorful food and, in turn, making it more appetizing for kids. Really great info in this post! Thanks so much, Mona! You're so right- colorful plates often result in kiddos liking the food more! Appreciate you stopping by! Thanks, Kaylee! My thoughts exactly! Making your own "protein power boxes" is a great way to save money and calories. And yes- the berries are seriously the best! Berries are my favorite thing about the summer months! Right there with you, Emily! These are so great Shannon! Keeping these handy for my girls this school year! These lunches look so tasty! And I love all the tips - I do the pre-packaged oatmeals to take with me when I travel! Thanks, Whitney! So glad it's helpful and yes- the oatmeal is perfect to take on the go! I absolutely LOVE these compartmentalized lunch boxes available now! Where were these when my kiddos were young?? You've got some great ideas for filling them with healthy kid-friendly bites too. Kudos! Right, Catherine?! They should have had these before because they definitely make lunch super fun! Thanks so much and glad you found these helpful! So glad you like it- I'm the same way- always snacking and wanting good protein options with fresh fruits and veggies too! Forget my daughter, I want to pack these lunchboxes for me! Actually my 10 year old buys her lunch often (which gets me of the hook) but I have to dust off the bento box for the times she wants a packed lunch. She loves the bowites! Haha! They're definitely kid and adult friendly. Nothing wrong with being off lunch duty sometimes! Bowties are so much fun! Thanks, Deanna! Thanks, Kara! I'm right there with you and it seems the response on these lunchboxes is a pretty enthusiastic one from both adults and kiddos! I love these ideas! So great! I know so many moms looking for more lunchbox ideas - now I've got some that I can give them! Thanks so much, Sara! Same here; was excited to send this out to all my friends and clients! So glad you found it helpful also! Great tips and fun lunch box combos. Everything looks like a winner for the kids. Thank you, Lauren! So glad you found them helpful! 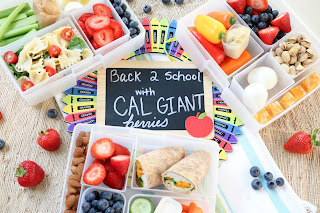 Love all of these creative back to school lunches! The key is colour, and all of these look gorgeous! Thanks so much, Abbey! You're so right- I'm always teaching parents that color = nutrition! How obsessed am I with berries?! Too obsessed. These lunches look so delicious! Love that pasta salad, too. Thanks so much, Stacey! Definitely had a lot of fun creating different fun but still easy and healthy options! I'm in love with the bento box trend right now! Such great ideas! Me too, Sarah! Thanks so much for stopping by! Sure thing, Lacy! Thanks for stopping by! Shannon, such great tips for back-to-school lunches! I love the bento box ideas! Sharing with my mama friends! Thanks so much, Kathryn! So glad it's helpful and appreciate you sharing! Forget the kids, I want to make these for myself! Great post and so many good school lunch ideas! At 14 & 16, my kids are packing their own lunches now (or buying lunch), but they're still discovering new foods they like all the time. My son just ate some kale salad and declared it "pretty good", and my daughter has developed a taste for sauted garlic green beans, zucchini, and carrots~of course with a smidge of butter thrown in for good measure :-) I can't wait to make your sheet pan breakfast!! Thank you, EA! Love that your kiddos are developing their tastebuds! And I'm sure you do make a great kale salad! Thanks again and let me know what you think of the sheet pan meal if you get to make it!